The Etruscan language is universally accepted as an isolated case. It cannot be shown conclusively to be related to any other language, living or dead, except for a couple of sparsely attested extinct languages. Raetic, recorded in the Alps, was clearly related to Etruscan judging by the few inscriptions found. Lemnian, recorded on the island of Lemnos, also appears to have been related to Etruscan. A third language, Camunic, sparsely recorded in NW Italy and written in the Etruscan alphabet, may possibly also have been related, but the evidence is too sparse to allow any safe conclusions. Etruscan had ceased to be spoken in the time of imperial Rome, though it continued to be studied by priests and scholars. The emperor Claudius (d. 54 CE) wrote a history of the Etruscans in 20 books, now lost, which was based on sources still preserved in his day. The language continued to be used in a religious context until late antiquity; the final record of such use relates to the invasion of Rome by Alaric, chief of the Visigoths, in 410 CE,(1) when Etruscan priests were summoned to conjure lightning against the barbarians. There is a corpus of over 10,000 known Etruscan inscriptions, with new ones being discovered each year. These are mainly short funerary or dedicatory inscriptions, found on funerary urns, in tombs or on objects dedicated in sanctuaries. Others are found on engraved bronze Etruscan mirrors, where they label mythological figures or give the name of the owner, and on coins, dice, and pottery. Finally, there are graffiti scratched on pottery; though their function is little understood, they seem to include owners' names as well as numbers, abbreviations, and non alphabetic signs. The origin of the Etruscan alphabet is not in doubt. The first alphabet was invented by Semitic-speakers in the ancient Near East, though the Caananite and later Phoenician alphabets had only consonants, and no vowels. The Greeks derived their alphabet from the Phoenicians and added vowels, producing the first true alphabet. A western variety of the Greek alphabet was carried by the Euboean Greeks to Italy, and the Etruscans acquired the alphabet from them. The Etruscans in turn passed on the alphabet to the Romans. The Germanic Runes (the Futharc) are now thought to derive from the Northern Etruscan alphabet, a fact which supports the existence of a vast Etruscan trading network. The present day notion that there is a "mystery" regarding the Etruscan language is fundamentally erroneous; there exists no problem of decipherment, as is often wrongly asserted. 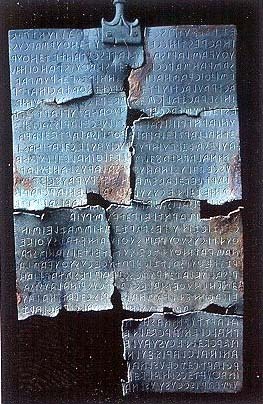 The Etruscan texts are largely legible. The real problem with the Etruscan texts lies in the difficulty we have in understanding the exact meaning of the words and grammatical forms. A fundamental obstacle stems from the fact that no other known language has close enough kinship to Etruscan to allow a reliable, comprehensive, and conclusive comparison. The apparent isolation of the Etruscan language had already been noted by the ancients; it is confirmed by repeated and vain attempts of some to assign it to one of the various linguistic groups or types of the Mediterranean and Eurasian world. However, there are in fact connections with Indo-European languages, particularly with the Italic languages, and also with more or less known non-Indo-European languages of western Asia and the Caucasus, the Aegean, Italy, and the Alpine zone as well as with the relics of the Mediterranean linguistic substrata revealed by place-names. This means that Etruscan is not truly isolated; its roots are intertwined with those of other recognizable linguistic formations within a geographic area extending from western Asia to east-central Europe and the central Mediterranean, and its latest formative developments may have taken place in more direct contact with the pre-Indo-European and Indo-European linguistic environment of Italy. But this also means that Etruscan, as scholars know it, cannot simply be classified as belonging to the Caucasian, the Anatolian, or Indo-European languages such as Greek and Latin, from which it seems to differ markedly in structure. (3) the bilingual, based on the comparison of Etruscan ri tual, votive, and funera ry formulas with presuma bly analogous formulas from epigraphic or literary texts in languages belo nging to a closely connected geographic and historical environment, such as Greek, Latin, or Umbrian. Nonetheless, with the increase of reliable data, in part from more recent epigraphic discoveries (such as the Tabula Cortinensis and the Pyrgi Lamellae), the need to find the one right method appears to be of decreasing importance; all available procedures tend to be utilized. Of the longer inscriptions, the most important is the Zagreb mummy wrapping or "Liber Lintaeus", found in Egypt in the 19th century and carried back to Yugoslavia by a traveler (National Museum, Zagreb). It had originally been a book of linen cloth, which at some date was cut up into strips to be wrapped around a mummy. With about 1,300 words, written in black ink on the linen, it is the longest existing Etruscan text; it contains a calendar and instructions for sacrifice, sufficient to convey some idea of Etruscan religious literature. From Campania, Italy comes an important religious text, inscribed on a tile at the site of ancient Capua. From Cortona comes an inscription on bronze,(top of article) which details a land contract between two families. The few Etruscan-Latin bilingual inscriptions, all funerary, have some limited importance with respect to improving our knowledge of Etruscan. 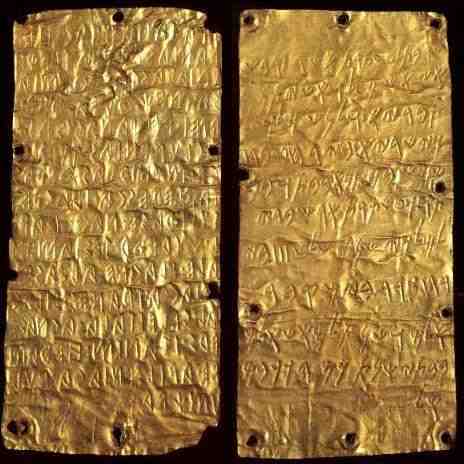 However, the inscribed gold plaques found at the site of the ancient sanctuary of Pyrgi, the port city of Caere, provide two texts; one in Etruscan and the other in Phoenician, of significant length (about 40 words) and of similar content. They are the equivalent of a bilingual inscription and thus offer substantial data for the elucidation of Etruscan by way of Phoenician, a known language. The find is also an important historical document, which records the dedication to the Phoenician goddess Astarte of a "sacred place" in the Etruscan sanctuary of Pyrgi by Thefarie Velianas, king of Caere, early in the 5th century BC. The following is an attempt to translate the (first) Pyrgi Tablet based on a number of sources. In the transliterataion I have used an upper case K to represent the Etruscan letter "ch" (as in the German Bach). The Etruscan letter which resembles the Greek Theta, pronounced like "th" in "thing" is represented by Anglosaxon "Eth" (ð). This temple and (this) statue have been dedicated to Uni / Astarte. Thefariei Velianas, head of the community, donated it for the worship of our peoples. This gift of this temple and sanctuary and the consecration of its boundaries during his three year term in the month of Xurvar(June?) in this way, and in Alsase (July?) this record together with the divinity/statue shall thus be buried by order of the Zilach that the years may outlast the stars. Several other sources talk of the Sacred books being kept in the temple of Apollo, with some direct quotes from this source. -describes the Annals of Etruria. "I have authority for believing that in that age Roman boys were regularly schooled in Etruscan literature, as nowadays they are trained in Greek." "Ager Romanus primum divisus in partis tris, a quo tribus appellata Titiensium, Ramnium, Lucerum. Nominatae, ut ait Ennius, Titienses ab Tatio, Ramnenses ab Romulo, Luceres, ut Iunius, ab Lucumone; sed omnia haec vocabula Tusca, ut Volnius, qui tragoedias Tuscas scripsit, dicebat...."
"The Etruscan word for an actor is istrio, and so the native performers were called histriones. These did not, as in former times, throw out rough extempore effusions like the Fescennine verse, but they chanted satyrical verses quite metrically arranged and adapted to the notes of the flute, and these they accompanied with appropriate movements...."
A brief mention of Tyrrhenian songs read backwards. S4: Encyclopaedia Britannica, Standard Edition, 1999. Compilation and translations from French, Italian and Latin by Rick Mc Callister and Silvia Mc Callister-Castillo. 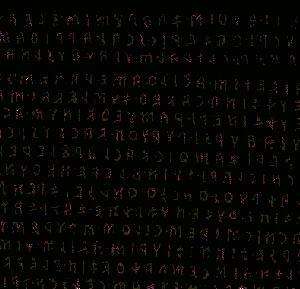 A comprehensive site, which gives extensive comparisons of Etruscan words with other languages.